We've all been there: trapped in a seemingly neverending conversation with no obvious way out. How do you escape without hurting the other person's feelings. Never fear — whether you're at a party, on the phone, or stuck in an email chain, we have exit strategies for you. Focus on your conversation partner. This may not be the advice you want to hear when someone's been talking your ear off for twenty minutes about his cat's dental problems. But really, the only reason it's stressful to get out of situations like these is that you don't want to make your (long-winded) conversation partner upset. I spoke to Ann Marie Sabath, author of Business Etiquette: 101 Ways to Conduct Business with Charm and Savvy, who says the key to avoiding this is to "focus on the other person." Don't just say "I need to get to a 2:00 meeting" — instead, "Say something the other person mentioned during your encounter like 'Joe, I hope your son's soccer game goes well.'" Bringing the attention back to the other person can let them know you were listening to them, not just looking for a way out. I also talked to Jacqueline Whitmore, founder of EtiquetteExpert.com and author of the upcoming Poised for Success: Mastering the Four Qualities That Distinguish Outstanding Professionals, who puts this a bit differently: "you have to engage before you disengage." Let the person know that you're interested in them and what they have to say before you take off. There's something called a conversational rambler, somebody who will just go on and on if you allow him or her to. 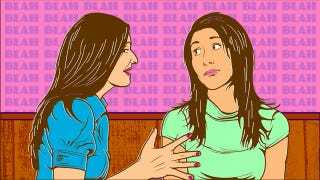 If you have a conversation with someone like that, you have to take control — otherwise you're going to zone out, and that person's going to keep talking. One of my suggestions is, take control of the situation by asking that person a question, and then that person will answer the question, and then you conclude. If you control the flow of conversation, you have more influence over when it ends. And you can bring it to a natural close without suddenly interrupting someone. If you're on the phone, and you know you don't have much time, Whitmore advocates stating that up front, "letting them know what your timeframe is." That way when you have to leave after ten minutes, you're not being a jerk — you already let them know this was going to happen. This strategy could also work, with some modification, at a party — "I'm on my way out, but I just wanted to say hi." Warning: do not use this method if you are not actually on your way out, because then the person will see you chatting with others and be annoyed. Print something that you don't need to print, and say, "I've got to get this thing printed, come with me down the hallway." At least then you can get them out of your office and out of your space. And then once you get to the printer with them, linger. Don't head back to your office, head to ladies' room, head to kitchen. Don't go back to your office where it can be comfy and it's just the two of you talking, and he or she can go on and on for hours. The double-edged sword of "I'm going to let you go." You could say something like, "I want to respect your time and I notice that I have another appointment in a few minutes, could I answer this question and then we take this call another time." You want to make it sound like you're the one who's being mindful of the other person's time, not that that person is wasting your time. In my experience, this one can work well if you're sincere about it. "I know you're really busy, so let's catch up again soon," can sound good if the person actually is really busy, or if you're both in a time-crunch situation. It works less well if you're just chatting with a friend and then they suddenly say they're going to "let you go." That can sound condescending and a bit transparent. In general, sounding like you're being mindful of the other person's time works best when you actually are. Griffin's advice for avoiding endless email chains is simple: "the more abrupt and direct you are the less a reply is necessary." She advocates the following, especially if you're emailing a work subordinate: "just thanks and then period, stop asking questions, stop pondering what could be done, don't even sign it." In general, Whitmore and Griffin agree that you don't need to reply to a thank-you. And if a group email chain becomes too long and lacking in substance, Griffin says you should feel free to ignore it. You can always ask somebody to bring you up to speed later if you need to. Schedule another time to talk. What I've always found to be helpful is to Say, "I really want to hear this but I've got so much work to do, let's grab a drink after work," or "let's get a manicure later on this afternoon." Show that you're interested and you want to be her friend but that now is not the time. Similarly, if you need to leave a party, "I've got to go, but let's hang out soon" is a time-honored exit strategy. A caveat: empty plans to hang out later are pretty transparent. If you actually don't want to pick up the conversation at a later date, don't suggest this. However, if you'd like to talk more, but just not right now, making plans for later on can be a way of reassuring people that you're not just blowing them off. And then you can resume at a time when talking is fun for you, not stressful.